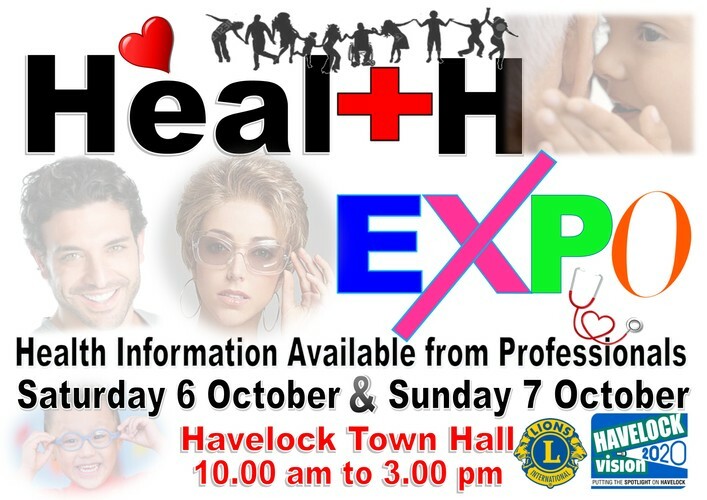 Havelock's annual Health Expo with over 25 health and life-style professionals displaying information and giving advice. Entry is free and there are rooms available for private consultations, if required. Advice is available for all ages - from pre-school to elderly and includes diabetes checks, neighbourhood watch, civil defence and green prescription. This event is arranged and sponsored by Lions Club of Havelock and Havelock Vision 2020 Charitable Trust. The Health Expo will be a collection point for spectacles, hearing aids and hearing batteries which the Lions Club are collecting to be sent to those in need in the Pacific Islands.